Have you noticed that as you maneuver your life, there is quite a bit of knowledge that is not easily accessible? Even if you are “book-smart," “street-smart," or an Internet junkie, many of us are still struggling and looking for answers. What we all wish to be is “access-smart." •Change your mindset today: enhance your resume tomorrow. •Don’t let demons cloud your thinking. •Get out of your zip code. •Put your best voice forward. At the end of each section, Gaining A.C.C.E.S.S. 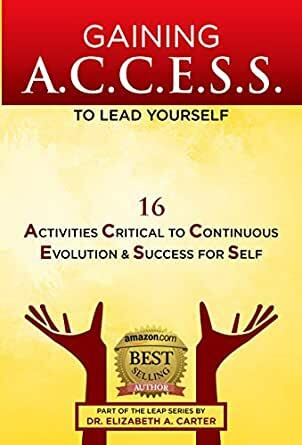 to Lead Yourself: 16 Activities Critical to Continuous Evolution & Success for Self provides reflection and action items in order to provide the missing key to help you get your next job, promotion, or opportunity and reach that lifelong dream or goal (purchase the workbook to record your responses). .
5.0 out of 5 starsExcellent instruction on how to change, grow, and succeed. There is so much in this book that will be useful to anyone who wants to make a change professionally or personally. 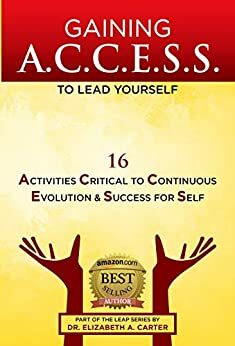 If you feel you have a roadblock preventing you from taking the next step that you need to take in order to have a better life, read this book. While reading it, perform the actions that Dr. Carter suggests you take. Those actions will ensure your change takes place. Those actions will ensure you grow. Those actions will ensure you succeed. I enjoyed reading this ebook. This should be the 1st book that any student should read before starting their career as a professional in any field. Dr. Carter gives tips that can help you excel.